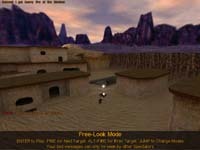 Description: Enter the enemy Base and make your way to where their Flag resides. Grab it and bring it back to your base. Place it on the raised square next to your flag to Capture it. the raised square next to your flag to Capture it. Map made by David Birebent from Montreal Qc, Canada.